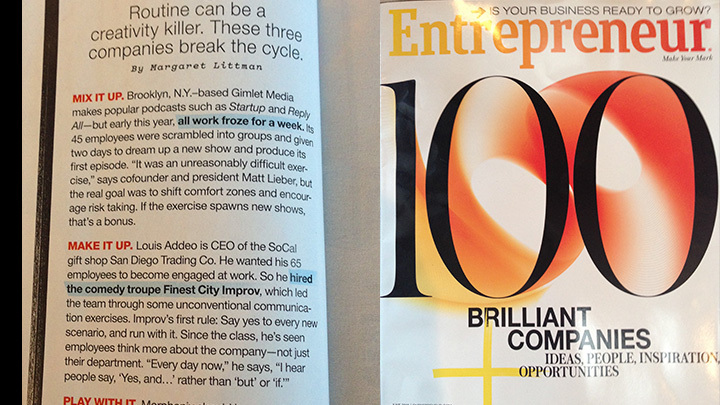 Inspired: An Improv Blog We're in Entrepreneur Magazine! Excited to be mentioned in the June issue of Entrepreneur Magazine! “Make it up!” is one of three tips for snapping out of the creativity rut. Our client San Diego Trading Company is used as the example of someone doing this successfully with the help of our improv at work training. Get your staff saying “Yes! And…” rather than “yeah… but….” with improv training.